According to Sperling’s BestPlaces.net, not only is St. Louis (of course!) a best place to live and work, but it receives about 15 inches of snow each year. And while this is well below the 26 inches of snow that the average US city gets per year, as those of us who call this part of the country home know all too well, those 15 can come down fast and furious. 1. Moving your business may take longer than planned. A number of factors can lead to your business move taking longer than planned, and as you might expect, Old Man Winter is behind all of them. For example, roads may be snowy, icy, or possibly closed, which will result in longer time on the road. In addition, slippery conditions will require your moving team to take necessary precautions when loading and unloading items, and one of the adjustments will be to slow things down so that people and assets are safe. 2. Have a contingency plan just in case. It is uncommon for weather conditions to become so dangerous that an office relocation has to come to a temporary halt. 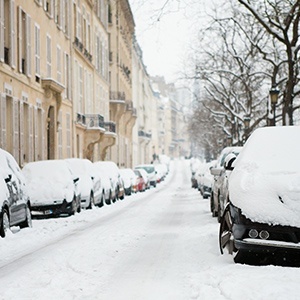 However, given that the weather in and around St. Louis can literally change within minutes – going from sunny skies to blizzard-like conditions – it’s important to have a contingency plan just in case. For example, it is a good idea to know that if furniture on-the-move cannot be relocated as planned, that it can be taken to a safe storage facility until the weather clears up, and the move and resume. 3. Carefully safeguard items and equipment. Your moving team will take ownership of carefully safeguarding your items and equipment from both moisture and cold. However, it’s important that you instruct your employees on how to move items that they are responsible for relocating, such as office supplies, and personal items like plant. If you’re working with a professional moving team, then they’ll certainly provide you with advice and guidance. To learn more about safely and successfully moving your business in the snow, or anything else that Old Man Winter throws your way -- contact the Precision team today. Your consultation with us is free, and with over 30 years of experience serving clients throughout the St. Louis area, you can be assured that we have seen it all!